Now Available! 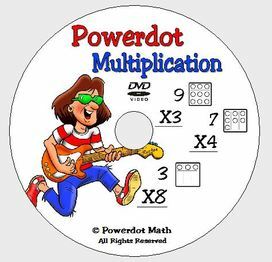 Powerdot Multiplication DVD! The Powerdot DVD includes 13 music videos and an 8 page instruction booklet to help you get amazing results. Special Introductory Price. Combo Packs available. There are two main components to the Powerdot Math Multiplication Program. The first is a fun and exciting songs (found in either the new DVD or the music CD) that teaches students to skip count by numbers from 0 to 12, and the second is an engaging activity book consisting of 100 pages of lessons, practice sheets, tips, instructions and the Powerdot Numbering System. Similar to dots on dice, the Powerdot Numbering System allows students to count by every number from 0 - 12 as easily as most of us count by fives or tens. By using the "Lock In" technique taught in this package, students memorize multiplication facts as they progress through the program and, over time, typically eliminate or reduce their need to skip count as their speed increases.